If you've so much as glanced at a financial news outlet recently, you're probably aware that Warren Buffett released his 2012 annual letter to Berkshire Hathaway shareholders last Friday. True to form, the well spoken and ever-quotable CEO offered dozens of entertaining bits of investing wisdom, and in doing so he provided plenty of new fodder with which we can analyze what makes both Buffett and Berkshire tick. Perhaps the most noted section of the letter so far revolves around Buffett's assertion that Berkshire's per-share book value growth of only 14.4% in 2012 was "subpar" -- at least, anyway, when compared with the 16% return the S&P 500 achieved over the same period. When the partnership I ran took control of Berkshire in 1965, I could never have dreamed that a year in which we had a gain of $24.1 billion would be subpar, in terms of the comparison we present on the facing page. But subpar it was. For the ninth time in 48 years, Berkshire's percentage increase in book value was less than the S&P's percentage gain (a calculation that includes dividends as well as price appreciation). In eight of those nine years, it should be noted, the S&P had a gain of 15% or more. We do better when the wind is in our face. To be sure, Berkshire's book value increase in 2012 alone was nearly as twice as much as the current $13.2 billion median market capitalization of all companies that comprise the S&P 500 index (! ), so it does seem surprising that anyone would consider that gain anything less than stellar. Even so, the name of the game is to beat the market, right? And as Berkshire continues to grow, Buffett knows better than anyone else that beating the market will inevitably become an increasingly difficult task. The thing is, Buffett isn't necessary saying investors need to wait for a more lackluster market for Berkshire to start winning again. To the contrary, he later elaborated that both he and his longtime business partner, Charlie Munger, "believe the gain in Berkshire's intrinsic value will over time likely surpass the S&P returns by a small margin," thanks largely to their "outstanding businesses, a cadre of terrific operating managers, and a shareholder-oriented culture." How, then, does Buffett plan to prevent a mass exodus out of Berkshire Hathaway's shares and into low-cost index funds? The key lies in Buffett's easily overlooked statement at the end of the passage I quoted earlier: "We do better when the wind is in our face." So what does that mean? 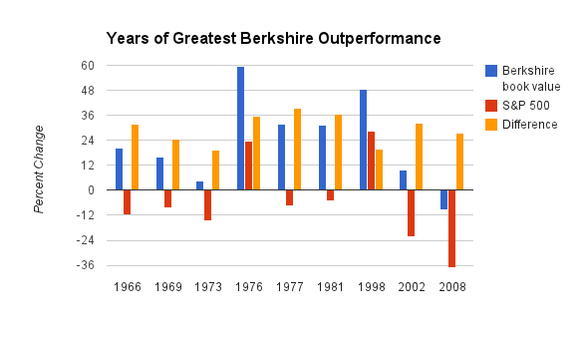 While Berkshire is usually able to hold its own in the years the S&P achieves exceptional growth, its relative outperformance becomes much more pronounced when the wider market is down or flat. Sure enough, the average return (including dividends) from the S&P during these years was an incredible 24.3%! Looking at the most recent three years, when we consider that the S&P rose 26.5%, 15.1%, and 16% in 2009, 2010, and 2012, respectively, it's still hard to fault Berkshire for falling slightly short of the mark. We can also note the last five times Berkshire underperformed the wider market index, it happened by an average margin of just 3.7%. Finally, even though Berkshire did indeed underperform, it's also noteworthy that the company still managed to grow its book value in each of these nine subpar years. Now, with the tables turned, here's where the S&P's true colors finally start to show. First, notice that the S&P actually lost value during seven of the nine years during which Berkshire outperformed the most. What's more, during six of those seven years, Berkshire managed to increase its own book value with -- you guessed it -- the wind in its face. As it so happens, of these nine years, the sole period during which Berkshire lost ground was 2008, when its per-share book value fell 9.6%. Even so, Buffett's baby outpaced the S&P that year by a whopping 27.4% as the index incurred a massive 37% loss. In short, while Berkshire's not afraid to put up a long jumper every now and again, it takes the most pride in its unrivaled ability to play world-class defense. Of course, this shouldn't come as a surprise, since we're talking about a man whose self-described first rule of investing is "never lose money." His second rule? "Never forget rule No. 1." This, my fellow Fools, is when Berkshire will start winning again. When (not if) the market finally decides to revert to the mean, patient long-term investors can rest assured Berkshire will be there to soften their landing. Thanks to Buffett, Berkshire Hathaway's book value per share has grown a mind-blowing 586,817% over the past 48 years. But with Buffett aging and Berkshire rapidly evolving, is this insurance conglomerate still a buy today? In The Motley Fool's premium report on the company, Berkshire expert Joe Magyer provides investors with key reasons to buy as well as important risks to watch out for. Click here now for instant access to Joe's take on Berkshire! The article Here's When Buffett Will Start Winning Again originally appeared on Fool.com. Fool contributor Steve Symington has no position in any stocks mentioned. The Motley Fool recommends and owns shares of Berkshire Hathaway. Try any of our Foolish newsletter services free for 30 days. We Fools don't all hold the same opinions, but we all believe that considering a diverse range of insights makes us better investors. The Motley Fool has a disclosure policy.